BUFFALO, NY (January, 2019) --- The WNY Flash Academy is one of only 46 clubs across the US to be announced as a Players First Licensed Club. Read more about what this means for the WNY Flash Academy by reading this article from US Club Soccer with our DoC, Rob Ferguson. Below is a letter received from US Club Soccer CEO Kevin Payne. 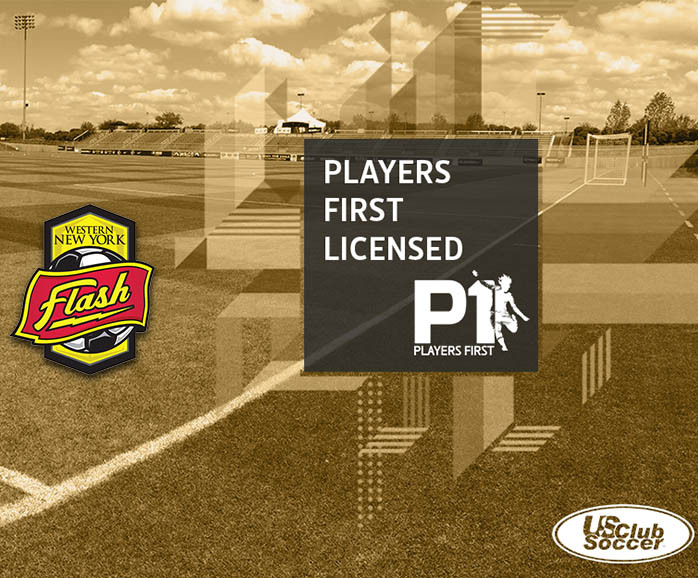 With great pride, I’d like to inform you that Western New York Flash has been recognized as a Players First-licensed club. After a rigorous application process, your club has proven to provide an exceptional, player-centered environment and upholds the high standards of this license. Being a member of a Players First club signifies that you are a part of a club that is providing support in five key areas: Club Development, Coaching Development, Player Development, Parent Engagement & Education and Player Health & Safety. It also means that your club creates a positive, holistic experience for every child participating in the club. · Players First™ represents a club’s commitment to placing the long-term interests of each individual player at the heart of every decision in structuring, operating, and managing a club. · Players First™ represents a club’s commitment to providing a holistic approach in player development for all of your players, recognizing that the soccer experience must include lessons and opportunity both on the field and off. · Players First™ represents a club’s commitment as professionals in youth development to expect ongoing learning, education and development from all staff members in order to ensure that players have the benefit of best-in-class information and resources in teaching and training young athletes. · Players First™ represents a club’s commitment to engage with and educate parents to help them understand and embrace the appropriate expectations and roles for them in their child’s overall soccer and athletic development experience. The ultimate goal of Players First licensing is to create and maintain this culture in youth soccer and your club is now officially one of the national exemplary leaders. We thank you for being a part of this culture and movement in youth soccer. The most important individuals involved in Players First clubs are the parents and families, and we deeply appreciate your support.